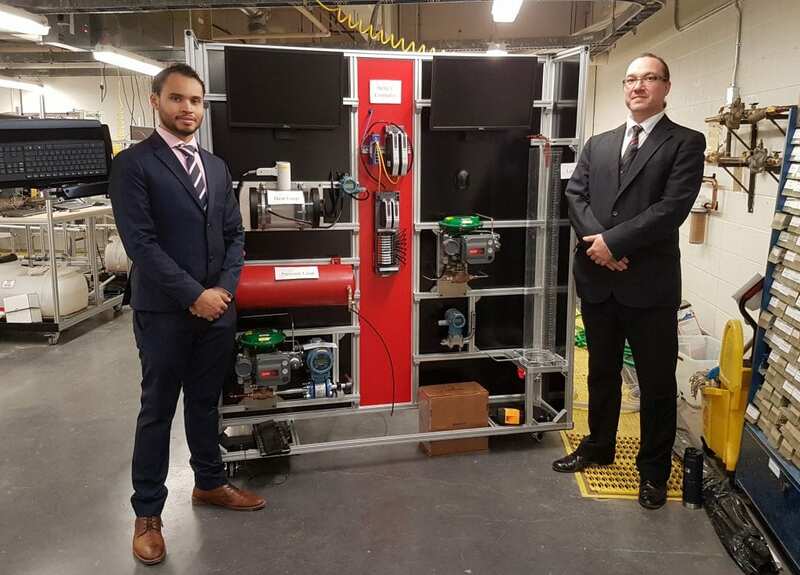 Demonstrating core institutional values of leadership, ingenuity and collaboration, a pair of Red River College students created a new process control training skid that’s being used by the University of Manitoba to prepare their own Engineering students for industry. As part of their final-year engineering design project, Eric Champagne and Joao Fidencio — both recent graduates of RRC’s Instrumentation and Control Engineering Technology program — partnered with Canadian firm Lakeside Process Controls on the skid, which is now a component of the U of M’s control engineering laboratory. Fidencio, who was working as a summer student for Lakeside when the project first came up, asked his manager if he could take the lead and use it as his final project at RRC. The form and construction of the skid were similar to one Bertin had designed earlier for the College, but there were enough differences to require a significant amount of additional work on the part of Fidencio and Champagne (shown above, at left and right). The skid itself is an invaluable tool for Engineering students looking to develop their process control skills using the latest hardware and software on the market. Equipped with Emerson transmitters and control valves — plus state-of-the-art DeltaV software — it allows students to control pressure, level, flow and temperature the same way they would on the frontlines of industry, introducing new capabilities to the U of M that RRC has offered its own students for years. The entire project took about four months from start to finish, and often required Fidencio and Champagne to put in 16-hour days. The skid was fully designed in CAD, with engineering drawings created before any material was cut (resulting in zero scrap, as Bertin points out). “The most challenging aspect of the project was the timeline — we had a very tight schedule and some of our suppliers did not deliver on time, so we had to call them on a daily basis in order to get our parts,” says Fidencio. Needless to say, both Lakeside and the U of M were impressed with the final results. “They both loved it,” says Fidencio, who was later hired full-time by Lakeside, and now works in Project Engineering Services on DeltaV and field service calibration. Learn more about RRC’s Instrumentation and Control Engineering Technology program.